Yong Family Takes On Run for National Unity 2018! We want to make mum’s birthday this year extra special by fundraising for Make-A-Wish Malaysia! Mum has chosen to adopt the wish of Fauzi, a 12-year-old boy with Acute Myeloid Leukaemia, to purchase a laptop to help him to catch up with his studies. About 6 months ago, my family received news that my mum was unexpectedly diagnosed with Stage 4 Lymphoma Non-Hodgkin’s cancer. Since then, she has undergone and completed 6 cycles of chemotherapy and is thankfully, on the road to recovery. 26 October 2018 marks her birthday and on this special day, my family and I have decided to participate in the Run for National Unity 2018 (held on 20 October 2018). Between the 6 of us, we will be completing a total run of 47 km! This will be the first time that we are participating in a run as a family. To top it off, we wanted to make mum’s birthday this year extra special by fundraising for Make-A-Wish Malaysia! Fauzi was diagnosed in late February 2018, and still undergoes chemotherapy treatment at HUKM in Cheras. He has spent long periods of time at the hospital and misses his family and friends. When at the hospital, there's not much to occupy his time hence he's requested for a laptop so he can follow up with some of his school work, especially with online resources for local school syllabus available these days. He's been hearing about this from his friends and knowing that he's missed classes since February, Fauzi is keen to catch up where he can. He is supposed to sit for UPSR this year but will likely have to miss the exam this year. To add to Fauzi's worry and fear, his elder sister was one of our wish child recipient last year but she has since passed away from Myeloid Leukaemia. 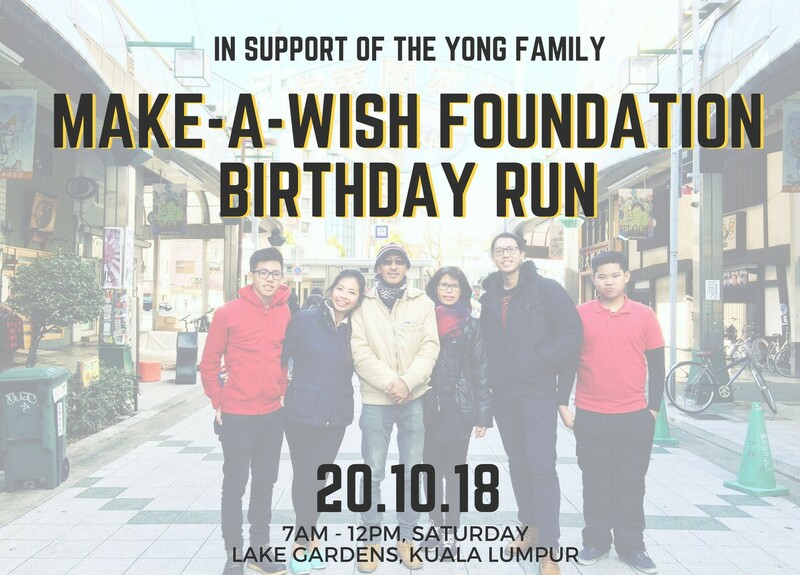 The Yong Family would like your support to help us to raise our donation target of RM5,000.00 before 30 October 2018 to support Fauzi in fulfilling his wish! In addition to your donation, if you would like to support our family by running alongside us, please do sign up for the run here: http://www.racexasia.com/event/run-for-national-unity-2018/ and let us know so that we can run together! For any further information or inquiries, please do not hesitate to drop an email to my sister Sarah-Ann at ﻿sarah.ann.yong92@gmail.com.